Check out these buddies on tour! Why See Rhett and Link? Zany YouTube stars of Buddy System and hosts of Good Morning Mythical duo Rhett and Link are on tour, bringing their unique brand of comedy, including hilarious rap battles, extreme food challenges, inventive (low budget) viral videos, sketches and of course, the wheel of mythicality to a venue near you this fall! 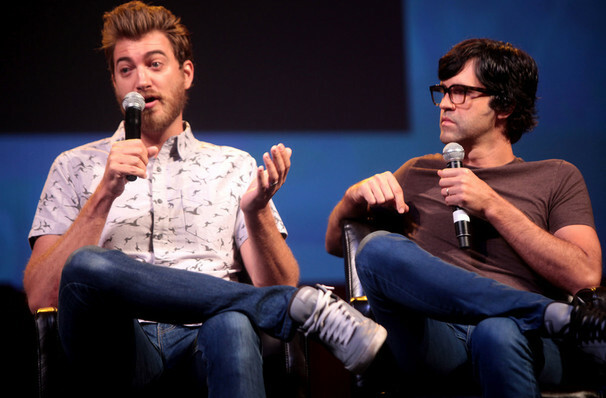 After a career that has seen these two lifelong friends rise to the top of the YouTube charts with their multiple shows, projects, and songs, they entered the world of publishing with the October 2017 release of their first book, a mixture of autobiography, trivia, and advice entitled Rhett and Link's Book of Mythicality. Expect this live show to include all the best parts of the pair, as seen on their daily talk show Good Morning Mythical where they tackle news, pop culture, crazy facts and disgusting taco combos. Rhett and Link met in 1st Grade in 1984. In addition to making a movie about this meeting (Looking for Ms. Locklear), they also claim to have made a blood oath in high school to one day work together. It looks like it worked boys! Sound good to you? Share this page on social media and let your friends know about Rhett and Link at The Fillmore. Please note: The term The Fillmore and/or Rhett and Link as well as all associated graphics, logos, and/or other trademarks, tradenames or copyrights are the property of the The Fillmore and/or Rhett and Link and are used herein for factual descriptive purposes only. We are in no way associated with or authorized by the The Fillmore and/or Rhett and Link and neither that entity nor any of its affiliates have licensed or endorsed us to sell tickets, goods and or services in conjunction with their events.